Explore Florida’s geology and paleontology with the “Fossil Hunters” cast members during the Gillespie Museum’s Science Café on Thursday, Feb. 7, 7-8:30 p.m. at Stetson University. The reality-TV science show follows a group of amateur paleontologists and friends during their adventures as they travel with their families to historic fossil sites. The world’s first and only fossil-hunting television series, “Fossil Hunters,” highlights the cast’s fossil collections and past and present excavations as well as world-class discoveries. The Science Café series at Stetson’s Gillespie Museum provides monthly programs that educate the general public about current science topics. During this informal conversation, visitors will learn about the cast members’ travels to various fossil sites and museums, along with exploring our state’s geological past. Cultural Credit is available for Stetson students. 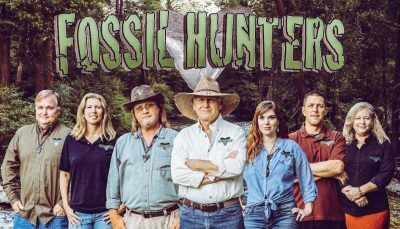 “Fossil Hunters” cast members and DeLand residents Don and April Brunning are co-producers of the PBS reality-TV science series. They are both avid fossil hunters and have been involved with some major fossil finds in the past. The Brunnings also own the Persimmon Hollow Enterprises production company, which films the show, and have extensive experience producing shows for PBS. During the conversation, the Brunnings will be joined by cast members Trish and Dave Dudiak, John Sacha (a contributor to the Gillespie Museum’s current exhibit, “Florida Formations: Shifting Seas and Sediments”) and Zach Zacharias (fossil curator at the Museum of Arts & Sciences in Daytona Beach). The evening will include an opportunity to view footage of the cast’s newest one-hour special, and the chance to look at some of their favorite fossil finds. “Our mission is to create the same kind of excitement and wonder for our audience that we feel every time we discover amazing fossilized treasures from our shared past,” explained Don Brunning. The “Fossil Hunters” cast will also be making an appearance during the museum’s Science Saturday, Digging into Florida’s Fossils on Saturday, Feb. 9, 10 a.m.-noon. Young scientists and fossil-hunting enthusiasts of all ages will have a chance to dig, collect and browse the museum’s collection. There will be a fossil pit, a scavenger hunt and a chance to learn from experienced hunters. Visitors under sixteen must bring along an adult to share what they have learned.